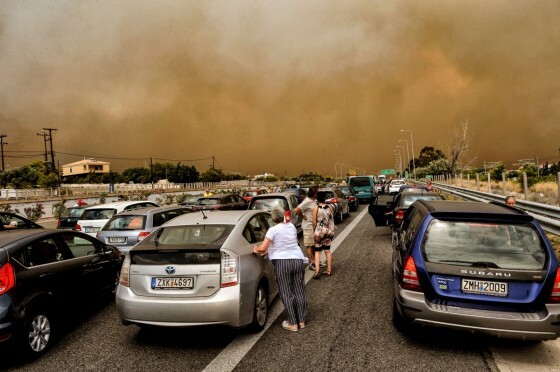 Whilst the devastation of the firestorm that hit the outskirts of Athens has left many with a deep sense of loss, the Greek community in Victoria is actively seeking to arrange a coordinated and focused relief campaign. Having earlier spoken to the Alternate Foreign Minister Terence Quick and the Greek Ambassador to Australia amongst other officials, the advice was to get organized but to wait for direction from Greece to best target any assistance that the diaspora would seek to offer. The Greek Community of Melbourne (GCM) has spoken with other Victorian Greek community organisations seeking a collaborative approach in raising support for the inevitable relief program that will follow. “We have spoken with both the Delphi Bank and the Bank of Sydney and asked them to open the relevant accounts to allow for donations to start to be collected. I have also spoken with a number of Greek community leaders encouraging them to coordinate altogether and provide a targeted response as requested by the Greek authorities,” said GCM president Bill Papastergiadis who himself has only just returned from Athens and knows the devastated region well. “I am sure that there will be a number of ways in which we can assist and have already started to collate the possible relief beneficiaries. To that extent, I have only just spoken with Giorgios Patoulis, the President of the Central Union of Municipalities of Greece (KEDE) who informed me that his organisation with the support of the Mayor of Rafina, will set up a fund for first home owners who lost a home and were uninsured” Papastergiadis explained. The GCM has also been active on the home front with meetings organised with the Federal Minister for Citizenship and Multicultural Affairs, Alan Tudge and the Victorian Minister for Multiculturalism, Robin Scott in the coming days. The Greek Community of Melbourne remains shocked and expresses its heartfelt support and deepest condolences to all the families who lost loved ones in the devastating firestorm. Our thoughts are with you. NOTE: The Greek Government has opened a bank account for the purpose of accepting donations for helping the victims of this catastrophe. More details here.